Chemi-pure can be used with all water types as a chemical absorption filter and ion generator and exchange unit to positively keep pH at a perfect constant level. Also fantastic for use with African Cichlids and Discus! Needs replacement only every six months under normal circumstances. Specifications:Use 1 unit up to 40 gallons, 2 units from 40 to 100 gallons, above 100 gallons add one unit for every 25 gals. 10oz. Contains 1 unit enough to treat 40 gallons. Soft corals - Crustose Coralline Algaes - Caulerpas - Gorgonias - Seafans - other invertebrates and fish of all species thrive and grow luxuriously with no water change necessary using real seawater or the better imported mixes. This is not a claim, but fact, experienced by thousands of CHEMI-PURE users. In fact, salt water fish have spawned repeatedly in 5 year old water. 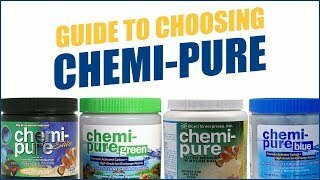 CHEMI-PURE does not remove trace elements and is the only filter medium which aids in the natural balance of positive and negative charges, with an emphasis on the beneficial negative ion. CHEMI-PURE comes packed in pure polyester filter bags in sealed plastic bottles, called 1 unit, one of which is recommended for up to 40 gallons of water, and which is completely active for 4-6 months with no `regeneration` or cleaning required and is cheaper than carbon or pads. The one filtration product we unreservedly recommend for use with CHEMI-PURE is the Poly-Filter, by Poly-Bio Marine! Use one pad above and one below the CHEMI-PURE bag. We also recommend the use of protein skimmers (foam fractionation). Use 1 unit up to 40 gallons, 2 units from 40 to 100 gallons, above 100 gallons add one unit for every 25 gals. 10oz. Contains 1 unit enough to treat 40 gallons. This works great. I have it in the media tray in my Nuvo 40. Clear water and happy fish! Worked as expected but bulk carbon would be a better value. A must if you want to use a carbon media!